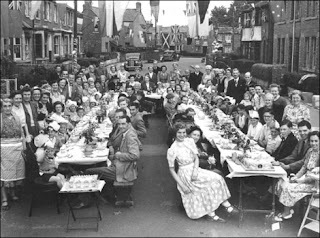 I love a street party. There's nothing I like more than just chewing the fat with all the people who live my street. We all have so much in common. I mean, we all live in the same street, for one thing. We can discuss the fact all our bins are collected on the same day and perhaps find out who parked the huge, throbbing and possibly sentient pool of vomit where the road curves, or left a bottle of Desperado with an inch left in the bottom on next door's garden wall. 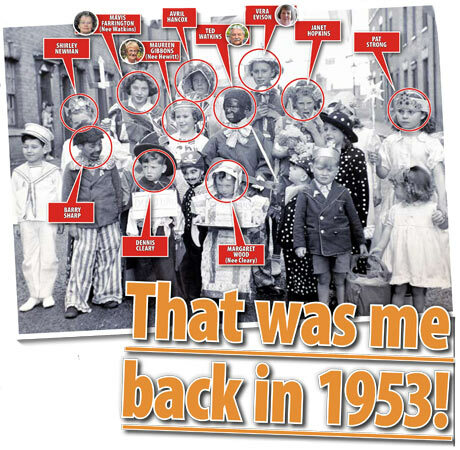 Maybe they were the same person? All of this whilst eating really manky food. Maybe I don't like these things after all, actually. Nevertheless, the old street party refuses to die in the United Kingdom, particularly for royal events such as coronation anniversaries, weddings and acrimonious divorces. 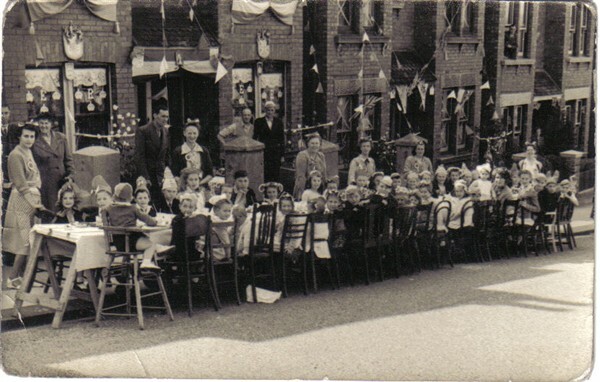 So, I decided to look through the annals of history to find pictures of the street parties which took place for the Queen's coronation in 1953, which we are all celebrating this weekend even though most of us aren't and anyway we're not because 1953 was 59 years ago. Nevertheless, the Queen is now the Queen and then was the Queen and crowns were worn and curried chicken was consumed and diarrhoea was enjoyed by all. Here are how our ancestors celebrated a good old-fashioned royal shindig before we got all cynical because of MTV, smart phones and Tony Blair. Here we see the true joy of the street party. A whole community coming together, putting their differences behind them and dressing their unwilling children as palace guards, policemen,Tinkerbell and Wilbur Smith. They have also let the street nutters - the ones who have a load of cats or who swear their budgie is a Catholic - out to join the fun. The whole Commonwealth is represented here, with particular regard to sailors, clowns and black people. This one is bugging me. The industrial scale of the tressle tableage here is completely undone by the disconcerting wave of the decoration down the centre. This caused great outbreaks of seasickness. I love this one. The table location is rather reminiscent of something which has dropped from space to anally probe the populace to figure out their penchant for sausage rolls. The good people of Trowbridge have obviously decided using up the whole length of their street is inefficient. 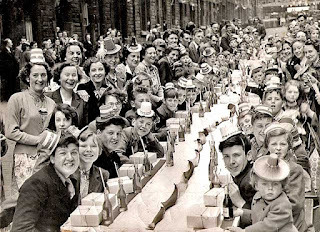 Time and motion studies of their street party commemorating the first time Edward VIII fucked Wallis Simpson proved the doubled-back approach was the best one for distributing fish paste sandwiches. This final one is from my home town. Totland Road in Brighton, just down from the racecourse. It seems that support wasn't easy to drum up here. Us Sussex folk are not easily excited by what's going on in that London. The people sat at this table here represent about two household's worth in austerity Britain of 1953. Note also that one homeowner has taped up their windows. Either this party was really expected to go off later or they were worried about the Red Menace. I'm STILL worried about The Red Menace... Is it a Superhero?